Cannabis legalization is not occurring in a vacuum. It is occurring along with huge changes in the health industry in general, as the planet moves towards a vegan and plant based lifestyle. And what better way to go organic than with a cannabis infused ambrosia fruit salad? You can now make a delicious salad even more delicious and even more nutritious with some carefully infused cannabis. Weed has innumerable health benefits and will soon be seen in health recipes worldwide. It has many more uses than just getting high. 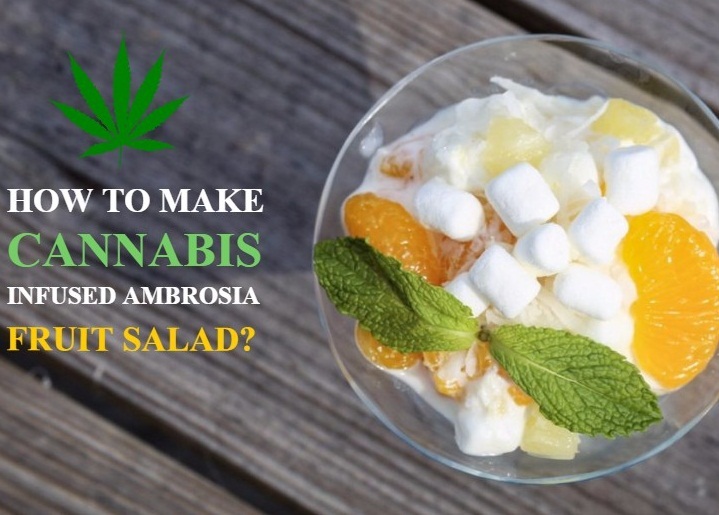 A weed infused Ambrosia fruit salad is one of the easiest marijuana recipes to make, and is also easy to scale. First, put all ingredients except the cannabis-infused coconut oil into the medium sized mixing bowl. Fold all the ingredients together with the tongs until it is all mixed and covered with sour cream. Distribute the cannabis oil evenly over the bowl. The hardest part of this is to make sure that the weed is mixed evenly. It makes take a few minutes to stir it properly. Seal the bowl and keep it in the refrigerator for at least 3 hours. Serve chilled with the mint sprigs. It should serve 6. Remember that your mileage may vary in terms of how much weed oil to put in, depending on how strong you want the salad, your preferences and the strength of the weed oil itself. All in all, this is a very straightforward recipe that is highly nutritious and easy to make.